Chief Warrant Officer 5 Howard E. (Gene) Touchstone, Jr., was appointed as the 5th Command Chief Warrant Officer (CCWO) of the Mississippi Army National Guard on 1 March 2009. He serves as the Adjutant General’s personal adviser on all Warrant Officer-related matters, particularly in areas affecting professional career management; recruiting, training, assignments and mentoring. His primary mission is to coordinate with the state military personnel office, the recruiting and retention office and subordinate commanders to implement a comprehensive Warrant Officer Recruiting Program. In addition, he establishes and maintains Warrant Officer mentorship and counselor programs within the state. CW5 Touchstone is a 1970 graduate of Richton High School. He began his military career when he enlisted in the Mississippi Army National Guard on 3 March 1971. He completed basic training and Light Wheel Vehicle Driver (64C) advanced individual training at Fort Leonard Wood, Missouri. On 8 October 1975, he transferred to the Texas Army National Guard as an Administrative Specialist in Headquarters and Headquarters Company, 2nd Battalion, 141st Infantry Battalion, Corpus Christi, Texas. He was discharged from the Texas Army National Guard on 2 March 1977. CW5 Touchstone reenlisted in the Mississippi Army National Guard on 2 November 1985 as a Clerk Typist in the 184th Transportation Brigade, Laurel, MS. In May 1986, he was hired as the full time Clerk Typist at the 184th Transportation Brigade. In February 1987, he transferred to the 168th Engineer Group as the Personnel Staff NCO. He became the Training Technician at the Mississippi Military Academy in July 1999. In February 1990, CW5 Touchstone graduated from Warrant Officer Candidate School at Fort McCoy Wisconsin. He was named as the Administrative Officer at Installation Support Unit (ISU), Camp Shelby, MS, in September 1990. He received his appointment as a Warrant Officer One on 21 September 1990. In June 2005, he was transferred to Joint Force Headquarters as a Military Technician in the Officer Branch. In May 2006 he was named as the Chief, Officer Branch. On 1 March 2009, CW5 Touchstone was named as the 5th Command Chief Warrant Officer for the MSARNG. He received a Bachelor of General Studies from William Carey University, Hattiesburg, MS in 1990. CW5 Touchstone has been mobilized twice, in November 1990 with ISU in Support of Desert Shield/Desert Storm. 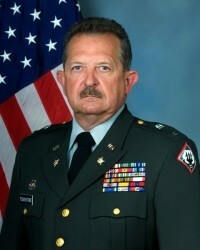 Upon notification of pending mobilization with Camp Shelby Training Site in January 2004, he built the Table of Distribution and Allowances (TDA) for that unit’s mobilization. His design is still in use by Camp Shelby Joint Force Training Center, Camp Shelby, MS.
CW5 Touchstone’s awards and decorations include the Meritorious Service Medal, Army Commendation Medal, Army Achievement Medal, Army Reserve Components Achievement Medal, National Defense Service Ribbon, Humanitarian Service Medal, Global War on Terrorism Service Medal, Military Outstanding Volunteer Service Medal, Armed Forces Reserve Medal, NCO Professional Development Ribbon, Army Service Ribbon, Mississippi Magnolia Medal, Mississippi Commendation Medal, Mississippi War Medal, Mississippi Medal of Efficiency, Mississippi Emergency Service Medal, Mississippi Service School Medal, Mississippi Longevity Medal.